LISTEN AGAIN for the weekly immersion, by streaming on demand via FBi or podcasting here. So it’s lovely to be lulled into our show with a glorious 21-minute piece from The Necks, Sydney’s beloved minimalist jazz ensemble. Their latest album is an oddity for them, commissioned by Stephen O’Malley‘s Ideologic Organ and therefore released on vinyl (oh well). It’s four sides, each track limited to 22 minutes max, and three are pretty lovely but nothing to write home to Mum about. On the whole the Necks perform at their peak (which places them among the best music creators in the world) at their usual length of about an hour. But the 21 minutes of “Blue Mountain” shimmer into glory almost immediately, sustaining and building on this grandiose beauty over the entire length. One of the more challenging recent releases on Perth’s Tone List came from the solo clarinet of Shoshana Rosenberg. Following last week’s remixes of guitarist Jameson Feakes, Rosenberg’s works are the subject of a second remix EP this week from the label, with Melbourne’s Papaphilia creating something abstract but still deliciously clarinetty out of her sounds. It’s been a little while since I’ve played Sydney’s haddocks’ eyes on the show, although he pumps out the new tracks at quite a rate, so it’s probably only been a few weeks! The latest batch of tracks see repetitive programmed drums slowly swamped by looped guitar noise and then yet more jagged guitar. At their extended length the tracks become quite hypnotic and weirdly ritualistic. Richard Youngs weirdly straddles the line between outsider art and, well, “insider”. He’s certainly acclaimed among those in the know, and is both a brilliant experimental musician and accomplished creator of song in folk, electronic and punk contexts. Buy his musical outlook is such that everything he creates is strangely sideways to the norm – in a really good way. the rest is scenery seems to me his best album in at least a couple of years, a set of rootsy folk songs done as only Youngs can, one-note basslines with acoustic guitar strums, piano ostinati, juddering guitar noise, chanted singing… and an incredible performance by Youngs’ young son Sorley on one track, sounding somewhere in between a world-weary Nico and a sinister English pixie. This week along with everything else, we had to farewell the extraordinary drummer Jaki Liebezeit, human breakbeat behind the seminal krautrock band Can. It’s impossible overestimate the band’s influence in terms of musical sound design, long, focused jams and of course, driving rhythm. But unlike the motorik drums of Neu!‘s Klaus Dinger, Liebezeit brought a propulsive syncopated rhythm that seemed to pre-empt the sampled funk breakbeats of hip-hop and drum’n’bass by decades. I played a track each from Tago Mago and Ege Bamyasi tonight, both of which are completely centred around Jaki’s beats. Keith Fullerton Whitman continues to digitize and release one archival DAT tape a month on his Bandcamp, with February coming a little early as he’s on tour next month. This time round there’s a long noise set from his early band El-Ron, and then three short & sweet early drum’n’bass experiments, two of which came out on the first proto-Hrvatski 12? Attention Cats, which I caned in the late ’90s… but one is unheard as of now, so I gave it a spin tonight… It’s exactly what the title describes, a bit of an attempt at µ-Ziq or Plug-style drill’n’bass I feel. Gareth Clarke released one album on the late lamented Sublight label in 2007, pretty much out of nowehere, and then disappeared again. It was great, melodic drill’n’bassy idm. He returned a couple of years ago with some archival work and some new stuff, some of which is more acid techno and some of which is the good ol’ frenetic breakbeat juggling. Fun stuff tonight from a new mini-album. Japan’s Quarta303, long known for his 8-bit dub and techno, finds his drum’n’bass groove on his new EP for Hyperdub, combining computer game bleeps with superfast breakbeats and a bit of a footwork impulse here and there. In 2014, German-based Japanese singer Kiki Hitomi (of King Midas Sound etc) got together with German/Japanese/English producers Dead Fader, DJ Hotel and DJ Die Soon to produce some shuddering, out-of-focus, massively bass-heavy jams. These became the blueprint for Hitomi’s fantastic solo album of Japanese digidub from last year, but these are much more primal, heavy and twisted. Myra Davies is a Canadian spoken word artist who’s been associated with the German industrial & electronic music scene since the early ’80s, along with her producers on this new album, Gudrun Gut and Beate Bartel, both of whom were associated with early Einstürzende Neubauten. On this album three of Davies’ biting spoken word works comprise a modernised, punkish take on Wagner’s Götterdämmerung, last opera of the Ring Cycle, while others are commentaries on life & art as personal and political. Despite not being traditional songs, the words & music fit together in a deeply pleasing manner. It’s thought-provoking and very listenable. His newest release in over a year sees Helm documenting a live performance at a theatre in Cairo in the middle of a cross-continental tour. There are variations on tracks from his Olympic Mess album and new pieces, and there’s a great energy to the performance, whether it’s more abrasive noise/drone or swooping sub-bass. Well, what a week in politics it’s been. The biggest. Gotta say, it’s the women who won it. About time they took over. LISTEN AGAIN for spiritual succour, by streaming on demand via FBi or podcasting here. Pleased to note that Run The Jewels 3 is FBi’s album of the week this week. It’s the third in a trifekta of fantastic albums from the hip-hop duo of El-P and Killer Mike. They just seem so perfectly suited to each other, it makes sense that this is basically the sole outlet for both of their creativity now. El-P’s sound is still influenced as much by Nine Inch Nails, idm and his Dad’s jazz as it is by classic hip-hop, but there’s also the sub-bass and swing of trap in there. Killer Mike’s been a very prominent proponent last year of Bernie Sanders’ campaign and in general against Trump. In an interview with The Wire this month, Mike talks about how after meeting El-P he immediately never wanted to work with another producer again, which is sweet – although there are some collaborators such as BOOTS on the albums… and another heavy-hitter, DJ Shadow, had them guest on his album of last year! But speaking of muted piano twinkly stuff, Max Richter has ably covered the meeting of piano-based classic music and electronica for some years now, referencing ambient Aphex Twin works as much as Steve Reich or Philip Glass. His latest album from Deutsche Grammophon, out this Friday, is a collection of music written for works by the early 20th century modernist author & feminist Virginia Woolf. Tonight we heard a few of the tracks written for Orlando, Woolf’s centuries-spanning, gender-challenging epic. I highly recommend the album for the gorgeous 22-minute closing track, which is based around the heartbreaking letter (read by Gillian Anderson) Woolf wrote to her husband upon discovering her dementia (“madness”) returning, having decided to take her own life. Continuing the piano theme from the last Richter piece, we join English composer & producer Daniel W J Mackenzie, who I’ve been playing for years on the show under his Ekca Lienaalias, for his new album every time feels like the last time, released on the excellent French ambient label eilean records. This one took me by surprise, which I’m a little embarrassed about because Mackenzie’s music has always been deep and complex. It’s not just a pretty ambient piano album – while solo piano tracks form its basis, there are twisted strings, scraping electronics, and droning distortions nudging their way into the picture, making for something a little more unsettling than you might expect. One to enjoy on a dark night. In a few weeks, Lawrence English will release his new album Cruel Optimism on his legendary Room40 label. As he’s known for now, it’s a heavy, dense album of drones, built from largely indistinguishable contributions from a massed array of contributors on acoustic instruments like piano, cello, vibraphone et al. As you can tell from the titles, it’s very much a meditation on these turbulent times, and while that’s something you’ll need to infuse into the music yourself, it’s very interesting to ponder Enlgish’s thoughts while listening to these majestic, tectonic sounds. Last week on the show we heard a new release on the Perth label Tone List from guitarist Jameson Feakes. Tonight we’ve got a remix of that work from Perth producer Kynan Tan, taking the exploratory sounds of the original and pounding them into 11 minutes of pulsating, glitchy electronic tones. It’s quite something! 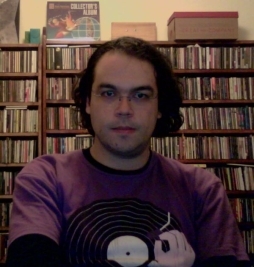 Cristian Vogel‘s always been a really interesting producer, and an interesting chap. From the early days he was heavily involved in the experimental end of electronica, whether breakcore, idm, techno, or dub, putting on shows with his No Future collective, as well as compiling the occasional compilation album. His music’s surfed the edges of minimal dub/techno, but also headed into hyper-processed electronica & breakbeat… he’s pretty unpindownable. Back around the turn of the century (lol) he had an amazing glitch-soul duo with Jamie Lidell called Super_Collider which was the first place I heard Lidell’s vocals (I knew him before that as a crazy idm producer!). Vogel’s last three albums on Shitkatapult all mix up those roots of techno and dub into mutant forms, with ghosts of rave and experimental touches never far off. Slightly farther out, or more far out perhaps, in the electronic waters are Second Woman, the duo of Joshua Eustis of Telefon Tel Aviv and longtime collaborator Turk Dietrich. Having now heard some early Telefon, it’s almost harkening back to that with its somewhat abrasive, very electronic tones and beats. It’s often fast-paced and stuttery, sliding away from perfectly graspable rhythmic patterns. Their new EP (appropriately weirdly entitled E/P) anticipates an upcoming album with two tracks and two remixes, including celebrated footwork maverick Jlin. LISTEN AGAIN because you love it. You do. You will. You do. Stream on demand at FBi, podcast here. We start with two tracks released on French label Human Mistake Records by a Melbourne artist, Warm Stranger. It’s dark, crunchy and head-nodding, and almost as spooky as the album cover the label has given it. Well recommended. Next, and incredibly quiet but really beautiful composition by Perth composer James Bradbury, rendered by Perth guitarist Jameson Feakes, who plays bowed guitar while a computer shadows and re-voices what it’s just heard. Olivier Alary is a Montreal-based French artist who I’ve been a fan of since his first album of glitching electronics & vocals on the Rephlex label. He’s had a long association with Fat Cat, so it makes sense that his first album under his own name is coming out on their post-classical sub-label 130701. To introduce it, the label has released a two track EP on which he trades remixes with his wonderful labelmate Ian William Craig, who here contributes vocals and then winds Alary’s composition through his trademark tape recorders. I first came across Canadian experimental artist Damian Valles through his 2011 album Skeleton Taxa, from which we heard the beautiful twangy guitar, percussion & organ drones of “Ascent Of The Past” tonight. I’ve sometimes pigeonholed him as “drone” or dark ambient, but it’s clear from the get go that there’s way more going on here… Even the two albums on French label VoxxoV, while based around dark, drawn-out textures, still have glitchy, stuttering guitar accents and quite a lot of movement. He’s begun 2017 with his best foot forward, releasing a collection of off-cuts and unreleased archival tracks on his own Bandcamp which hangs together as an impressively cohesive and strong album that starts to push his music into new territories. English label Opal Tapes is one of the cassette labels at the absolute forefront of quality electronic music these days, ostensibly focusing on house & techno but with a distinctly left-of-centre, experimental bent, and plenty of dub & bass thrown in. Their latest compilation Contemporary Dance features a few well-known acts and plenty of new (to me!) artists. I discovered the brilliant Belgian-Italian duo Lumisokea through Opal Tapes and have followed them and their other projects obsessively since, while I discovered Leeds-based techno artist Happaremixing Four Tet (here he appears in collaboration with an old friend called Jacob, who is not really a character from Twin Peaks). Emra Grid is a mysterious artist only known for another release on Opal Tapes, contributing something deliciously dark. Like Opal Tapes’, Project Mooncircle‘s 15th Anniversary Compilation already counts as a 2017 release. In a boxset handsomely designed by the legendary Dave McKean, it compiles a tonne of tracks that are as diverse as the label’s usual lineup, ranging from house to drum’n’bass, folktronica to hip-hop. Not played tonight are two great tracks from one half of Akkord, Synkro, channelling Burial with plaintive late-night ambient 2step… Tonight’s selections were the bouncing, pulsating techno of Erik Luebs segueing from Opal Tapes followed by the jazz-fusion hip-hop of CYNE and the footwork-jungle fusion of Deft. Speaking of jungle, breakcore legend end.user has returned after a number of years’ absence, at least in terms of album releases. The new album is pretty much straight, if tricky, drum’n’bass, with jittery drum programming and expansive synth pads as is his wont. It’s not exactly shiny, happy music, but it’s a real pleasure to sink into. And we finish with a surprising drum’n’bass/jungle segue into the music of Mark Van Hoen, aka Locust, idm/ambient/shoegaze legend who’s still making music today. His 1997 album The Last Flowers from the Darkness was originally released by Touch on CD, but now sees a 20th anniversary remaster & release on vinyl by Medical Records, including a number of never-before-heard bonus tracks. The first track we hear was one of his few true jungle-influenced tracks from back in the day, and the bonus track is some really nice crunchy bass-techno in the mid-’90s style. LISTEN AGAIN to the newest & best sounds around – stream on demand from FBi, podcast here. It’s great having Jasmine Guffond around Sydney again at the moment. She will be playing at the NOW now festival in a few weeks along with a whole slew of interesting experimental artists (check the link for the program). A split CDR just released from Beartown Records gives us four live tracks of beautiful layered & processed sounds, along with along with a 22-minute drone track from UK duo Plurals. Next up is another release, from the very reliable Indonesian cassette label Tandem Tapes. Run by an Aussie based in Jakarta, it often releases split cassettes with Australian and Indonesian artists, although it’s also teamed up artists from Europe and elsewhere. The latest release, featured tonight, has Melbourne duo FAD on one side, with percussion and electronics, and Jakarta-based experimental artist Mahesa Almeida with some fantastic crunchy electronics and also some scattered percussion. Back in November last year I played a couple of tracks from a brilliant new discovery, Icelandic singer & producer Sigrún. She’s worked with Sigur Rós, and remixed a couple of tracks as well, and we can maybe hear that in the crunching heavy bass that’s appeared in their more recent work. Of course comparisons to Björk are easily found, not just in the vocals but also in her attraction to experimental electronic production. I particularly love the outbursts of amen breaks in “Haltu Fast”, settling into a full-on jungle/breakcore segment before being overwhelmed by thick synths and multi-layered vocals. Also bringing in a jungle influence with chopped up amen breaks, but situating it more in a muted/mutant techno space is Portuguese artist MUTUAL. I really enjoyed his first EP on Hush Hush in 2015, but it looks like it never made it on to my playlists, so we heard a track in the middle tonight – but the new EP is really exciting with its melding of jungle, techno and later on some lovely orchestral samples. On his new EP Chambers as WSR for Samuel Kerridge’s Contort label, Manchester producer Emanuele Porcinai brings the sounds of cello, double bass and custom-made string instruments into very dark & murky territory. Along with low-pitched, moaning string drones and scratches, there are plenty of clattering industrial beats. It’s like ’80s industrial and contemporary industrial techno mixed with the double bass drones of Mohammad… In the middle there’s track from his previous Contort EP Stainless. I was very sad when Anthony Harrison abandoned his Konntinent project, which produced a large amount of amazing drone and detailed minimal folktronica. But he’s still making music, now with his electronic pop duo Paco Sala, who have just signed to Denovali and released a spooky new single. Expect more this coming year. aYia are a slightly mysterious electronic/ambient pop act from Iceland, who have released a single track in digital format from the formidable Bedroom Community. It’s a beautiful piece which justifies its presence on a label known for combining classical composition and cutting-edge electronics. Hopefully there will be more than this one track available from them soon! And finally, Sydney duo Disruptive Dumpling feature guitar/bass and synth/flute, with a jazzy, head-nodding piece of instrumental hip-hop and some kind of guru expounding upon some important matters of mind and philosophy. Nice. And so we’ve somehow made it to 2017. Here’s to a year in which at least the terrible things are terrible things we’re expecting, and the people who die are mostly… 2nd tier celebrities. LISTEN AGAIN because the best… well, it’s the best. Stream on demand from FBi or podcast here. Tonight is my second selection of the best music of 2016! And whatever else happened last year, it was a helluva year for great music.